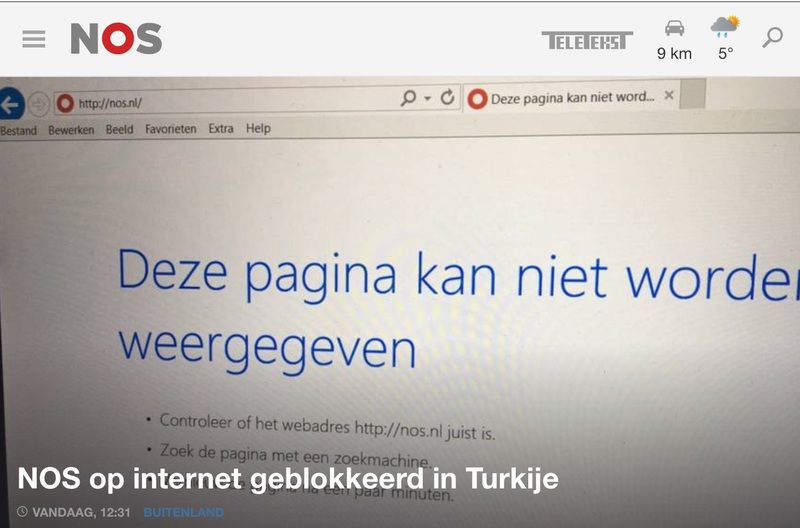 The website of Dutch public broadcaster NOS is unreachable for most internet users in Turkey, according to claims independently validated by Turkey Blocks. The restriction was reported shortly after the imposition of a national broadcast ban and social media shutdown following the assassination of Russian ambassador Andrey Karlov in Ankara. Our brief investigation of fixed broadband connections found that Turkish providers have each diverted the NOS.nl website to either a blockpage, a blank page or the ownership query page of Turkey’s Association of Access Providers (ESB). The block is implemented at the ISP level, hence some users may still be able to access the site and the extent is not fully known. Citing sources in Ankara NOS today reported that the block is likely related to a video of the ambassador’s killing published on its news website that went “viral” in the aftermath of the attack. That explanation seems reasonable but has yet to be confirmed officially. Meanwhile, an unrelated diplomatic tussle with the Netherlands culminated in Ankara’s recall of a senior diplomat in the Hague earlier today offering another speculative motivation for the block. The broadcaster explains that the video was sourced from Turkish media organisations, and subsequently published by many others, but that its content may have been singled out due to its popularity and share count. transparency data on blocked sites no longer available? Turkey Blocks researchers were unable to find an official administrative order or blocking order related to the loss of access, which would normally be issued for a block relating to national security or morality. Turkey’s internet authorities appear to have stopped providing lawyers and the general public access to transparency information on blocked websites in recent weeks: Both the Information and Communication Technologies Authority (BTK) and Association of Access Providers (ESB) yielded no such order via their query systems at the time of writing. Censorship researchers at the now-defunct Engelliweb project identified over 100,000 blocked websites in Turkey, though current figures are unknown and there is no longer an active effort to keep track of blocked domains and URLs. Most news sites blocked in Turkey were owned by domestic and not international publishers, with some notable exceptions. Russian news site Sputnik was officially blocked following a crisis following Turkey’s downing of a Russian jet, though access was later restored as relations between the two countries thawed. The BTK authority assumed internet censorship duties from TIB following the abortive 2016 military coup, however the organisations are now believed to be in the midst of another shakeup. Responsibility for internet restrictions is expected to transition to a new National Security Directorate under draft plans intended to pave the way for an executive presidency later in 2017.